I’ve been quite comfortably living inside of mom’s womb for 29 weeks now. Mom and dad keep talking about what’s going to happen when I come out, but I don’t know what that means, and I’m not sure I want to. I quite like it in here. Although it’s dark, I’m very comfortable, and I have more than enough room to move around. Right now one of my favourite things to do is dance…especially when mom is dancing too! She seems to really like what she calls her “90’s throwback dance tunes.” And although when I get too excited and dance too much, she complains a little bit, I think that she likes when I dance too…it’s a reminder that I’m still around. Aside from dancing, mom seems to be a pretty busy lady. She always seems to be moving! But, I like when she moves–it always helps me sleep. This weekend, mom went for what she calls a run. Although I can’t quite figure out what she’s doing, because it feels different than dancing, I like the way it feels. Actually, every time she does this, I have a great nap! But, when she stops and I wake up, I’m sure to let her know that I’m awake and ready to dance! And the fun starts all over again! Something else mom and dad like to do is something they call footy matches. 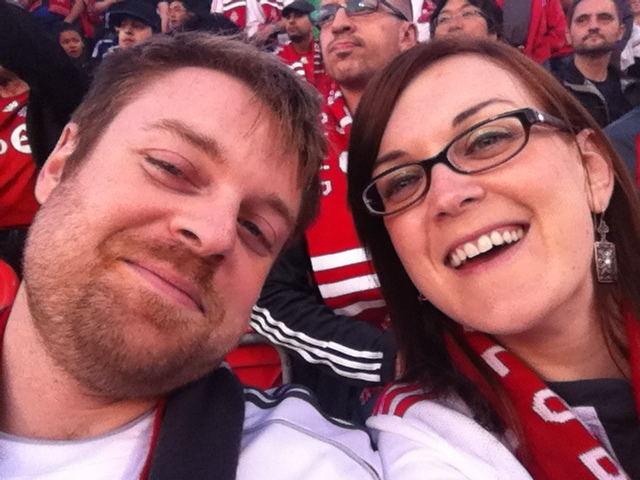 A while after mom went for her run, she and dad went to a footy match–something they called TFC. It seems like a lot of fun, but it sure was noisy! The whole time they were there, mom and dad were singing, yelling and mom ate something called a poutine. It was delicious–maybe my favourite thing to eat yet! I wonder if I can let mom know that I want more of that. Something I’ll have to work on! I’d really like to figure out what footy means, since dad insists that my dancing is actually kicking and that I am going to be a footy star. I guess we’ll just have to wait and see–maybe once I’m out, we’ll be able to figure it all out! How to go everywhere, and love it! A serious and sometimes funny blog about the challenges and changes during midlife. Your Fitness. Your Health. Your Life. Silent spectator in a rapidly changing world, mostly posting about new media with a mix of random musings. Travel, food, culture & more…. Who is in control of your personal data? This site is all about the love of reading.